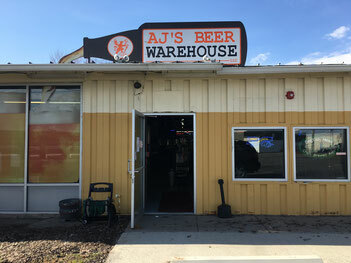 AJ’s Beer Warehouse LLC opened its doors on Monday, November 25, 2013 to all types of beer lovers, with selections for the casual drinker to the beer connoisseur and all of those in between. Located at 175 Clay Road in Henrietta, between Jefferson Road and Mushroom Boulevard, the former industrial building can be identified by the beer bottle sign on the roof and the exterior painted like a perfectly poured glass of beer – foam and all! The store has an eleven door walk-in cooler exclusively dedicated to New York State beer and cider, and a 22 door custom built walk-in “beer cave” we are already expanding! We have thirty draft lines of New York State craft beer for Growler fills and tastings, and we offer beer by the bottle, 4/6 pack, case and keg. We strive to provide a relaxed atmosphere, friendly staff with helpful insight, and great beer at great prices. If there is a beer you are looking for, ask us and we will try to find it for you. At AJ's, we keep our craft and domestic beer cold and draft lines clean. We do our best to maintain the quality of the beer we offer.